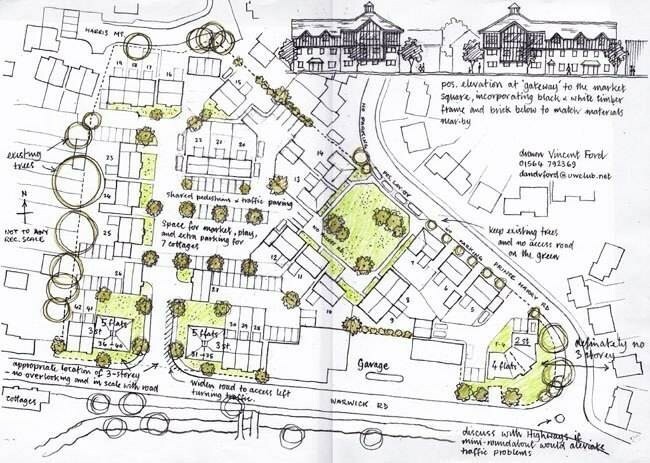 Vincent Ford, a resident in Castle Close and a retired architect, has prepared an alternative proposal which has been submitted to the Stratford District Planners. Download a large scale version of the revised plan. The Taylor Wimpey proposal submitted for planning approval. 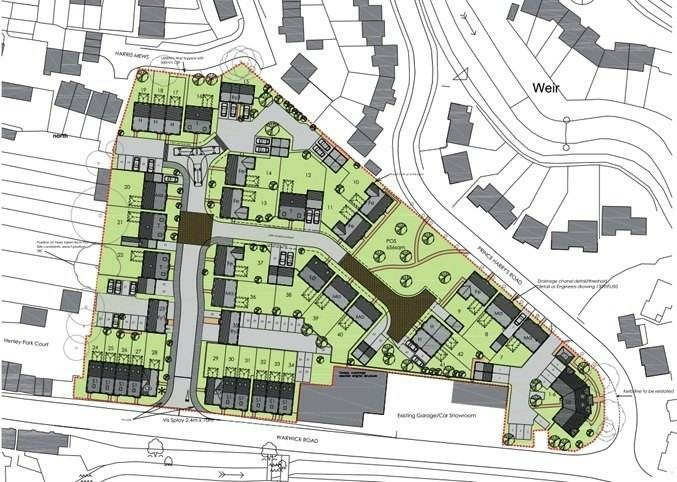 IT IS MOST IMPORTANT, IF YOU WISH TO OBJECT to any aspect of the proposed development, that each member of your household writes a separate personal and individual letter to the planning officer Mr Tony Horton. These letters should commence with "I OBJECT TO THE PROPOSED DEVELOPMENT ON THE FOLLOWING GROUNDS...." and then detail your specific objections. Through your publication I must report on an astonishing experience I had whilst attending the meeting of Henley & Beaudesert Joint Parish Council on the evening of Monday 6th December. 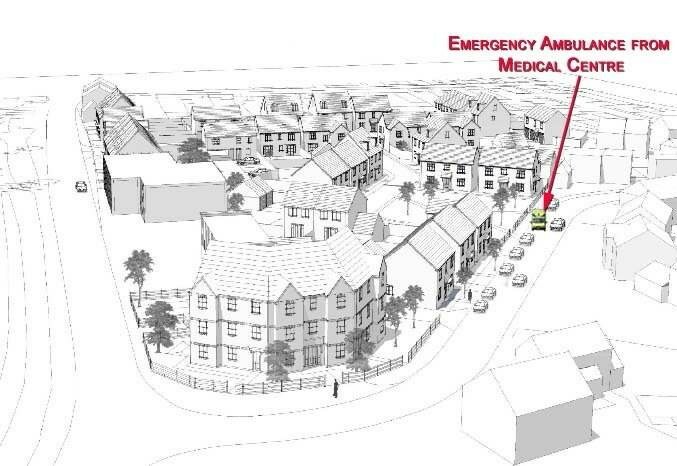 As a local resident I have some concerns about the planning application submitted by Taylor Wimpey for the Henley Market re-development. At the special meeting convened by the JPC at the High school on 2nd December I listened attentively to all the points raised by those who spoke up. After a few days contemplation, I decided to submit my views by email to each and every member of the JPC in order that they could take this into consideration when reviewing the planning application and the various procedures associated to it. On Monday night, I simply wanted to ensure that every councillor had received and read my email so I attended the JPC meeting in order to ask that simple question in the “open forum”. This is where members of the public are supposed to be entitled to three minutes to address the Council members on matters that concern them. Before anyone could speak, the chairman, Cllr Les Goodman, declared that no comments regarding the planning application would be permitted. He then invited me to address the committee from the public gallery. 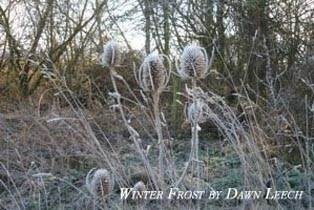 I tried to say that I had turned up on a bitterly cold night along with others in order to provide further information about the planning application. As soon as I commenced, he shouted over me and demanded that I not do so before I had an opportunity to explain why I wanted to speak. I was dumbfounded by this and bullied into sitting down. Mr Goodman made it clear that he was not going to permit me to speak any further on that subject. Councillor Les Goodman was dictating what members of the public could talk about in what is supposed to be an open forum. I didn’t realise that as Chairman of the Parish Council he had such powers of censorship over democracy. I felt offended as I was embarrassed in public by his behaviour and consider his manner to be an abuse of his position and have made a formal complaint to the Standards and Ethics Committee of Stratford District Council. I hope all those who witnessed this outrageous conduct will support my complaint by writing to the Monitoring Officer. If the JPC give this development the go ahead they will lose the confidence of the electorate that the JPC acts for the benefit of the community it is meant to serve and it will inflict further damage to what is already a much questioned and sullied reputation. The Chairman doesn't have the authority to make such decisions. Any attempt to mention the market development was stamped out by the Chairman - no Councillors were asked their opinion so the decision appeared to be taken by the Chairman alone. Cllr Osborne was not allowed to make her point in public session – once again by the sole discretion of the JPC Chairman. The JPC is meant to represent the residents, not operate unilaterally. Even Cllr Matheou was censored from talking about ‘compensation’ which I thought was a good point. With everyone standing over the District Council we ought to get a good result, so keep up the pressure and don't doubt that the CPRE will back you all the way. 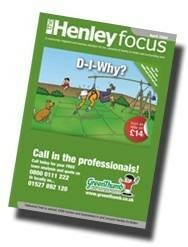 Can't believe the arrogance of the JPC and I fully expect a severe condemnation in the next issue of Henley NEWS. I was very disappointed with this item on the agenda last Monday- it was made quite obvious that we were not permitted to speak in the open forum prior to the meeting. Several issues were discussed at the "special "JPC meeting last Thursday, we were not allowed to make comment during that meeting, therefore residents should have been given the opportunity to make a comment during the public forum at the beginning of this meeting as it was on the agenda. The "no comments on the development" ruling was not voted for at the start of the meeting by the whole JPC. I found it unsatisfactory and undemocratic. I can understand Les Goodman not wanting to have further discussion on this matter but not sure whether he had the right to prevent it. There was a public session and therefore any member of the public should have been able to talk about any topic on the JPC Agenda. I believe there was a topic on the agenda to discuss the special meeting held on 2nd Dec and as such would have thought that public comment was admissible. Generally I got the feeling that there was little transparency about most subjects and it reminded me of some kind of secret society meeting. It was amusing to hear Les and others complain bitterly about a statement of fact in a circulated e-mail. This is surely another example of them believing they are above the democratic process. What is normal political activity for everyone else, is blackmail in his and others' eyes. A wonderful contribution made by Trinder and Love AGAIN! Should we be keeping a record of the number of meetings they attend and do not contribute? Plan 'too complicated' for council to decide yet - Stratford Herald headline. 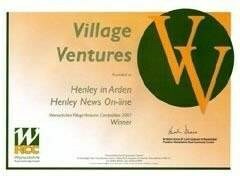 All the contributor's names are known to Henley NEWS but have not been included for obvious reasons. 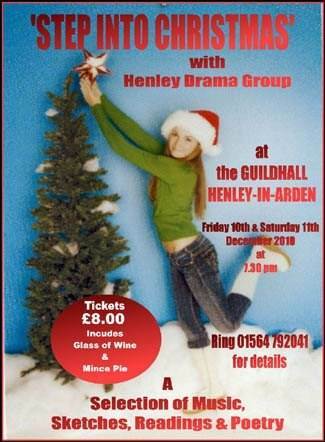 Henley Drama Group invites you to an evening of entertainment at the Guild Hall Henley on Friday 10th and Saturday 11th December at 7.30 pm. Tickets are £8 including mulled wine and mince pies. Take time out to enjoy some Christmas music and readings plus some comic sketches (remember the Two Ronnies!) Pictured here are the full Company of players who will provide the entertainment. 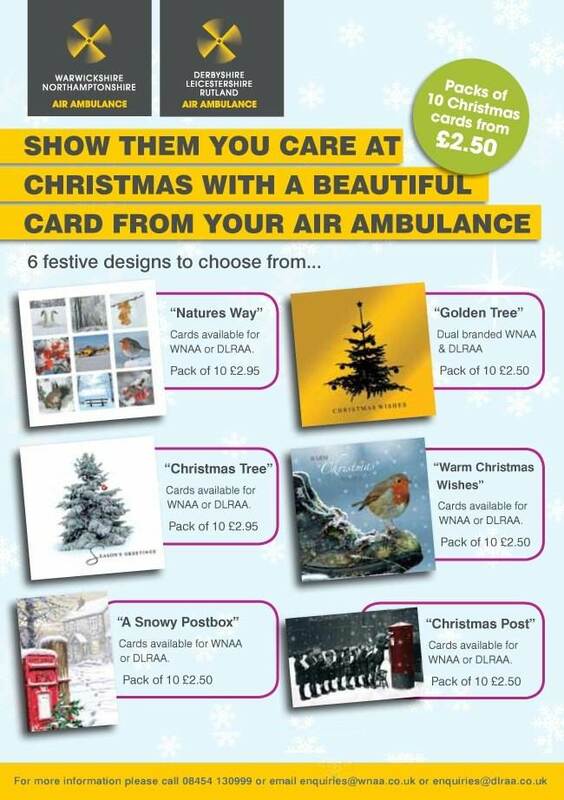 "Step into Christmas" and banish the winter blues! See you there! 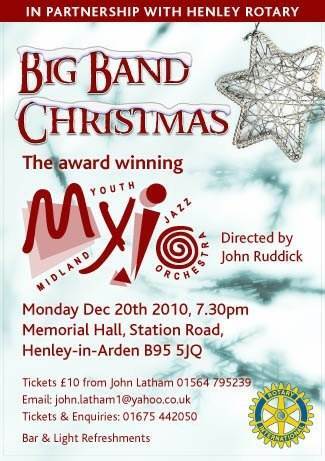 On Monday 20th December at 7.30 in the Memorial Hall, Henley-in-Arden, start your Christmas in style with some big band Christmas favourites. 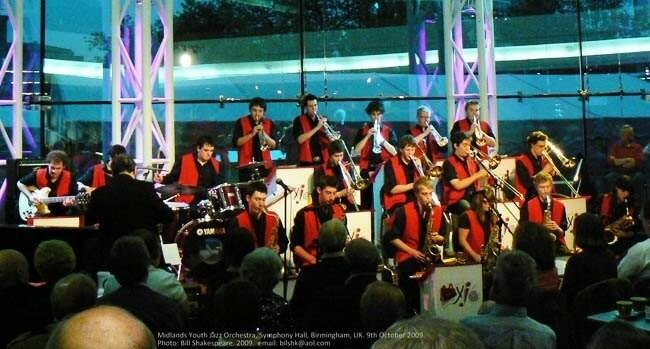 Join Rotary in welcoming the Midland Youth Jazz Orchestra (MYJO) to Henley for the first time ever! These talented young musicians with young singing sensation, 16 year old Sophie Feek, are bringing their Christmas show straight from its Birmingham performances to get Henley’s Christmas celebrations off to a flying start. The orchestra, with members aged from 16 to 24, is celebrating its 40th birthday this year. During that time it has developed an international reputation as being one of the best swing bands on the planet playing music in the style of Glen Miller, Johnny Dankworth, Ted Heath etc in their own polished and professional way. 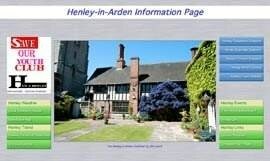 HENLEY WILDLIFE SOCIETY Tuesday 21st December will be an informal AGM followed by a social evening. Members are asked to bring food to share. Baptist Hall 7.45pm. Visitors are welcome to come along and join in the fun. 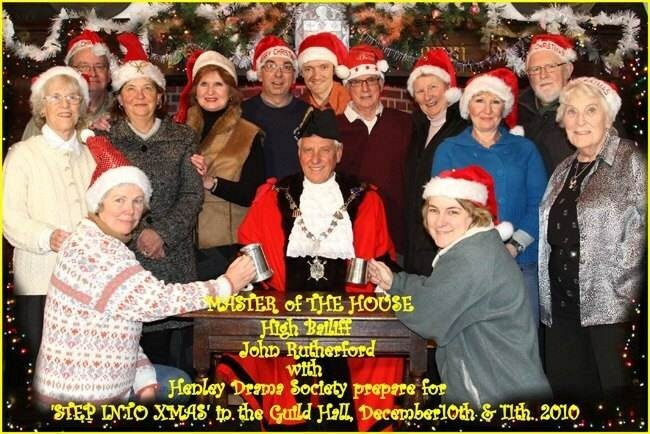 HENLEY DRAMA GROUP presents "Step into Christmas" a selection of music, sketches, readings & poetry, at the Guildhall, Henley, on Friday 10th & Saturday 11th December at 7.30 pm. 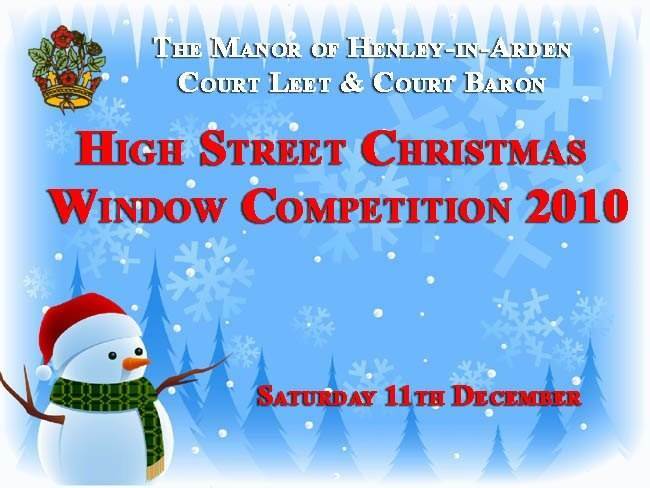 Tickets cost £8 which includes a glass of mulled wine & a mince pie. Come & join us for an evening of Christmas entertainment and festive fun! 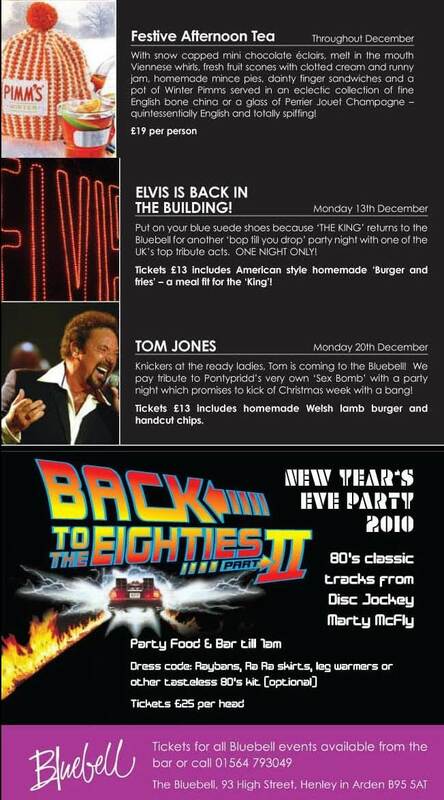 For tickets ring 01564 792041. RIVERLAND GARDEN The Garden Committee is organising two further events to complete the Riverland Garden. 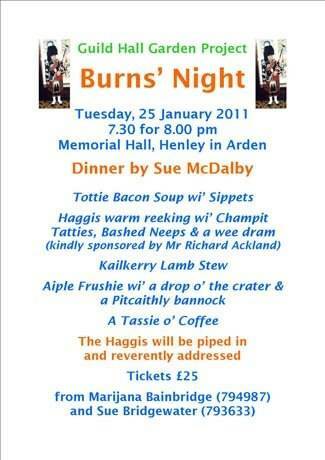 On Tues 25th Jan, Burn's Night, a four course meal will be provided by Sue McDalby. Tickets £25 each will shortly be available. On Wed 23 March, TV gardener Chris Beardshaw will give a talk on all aspects of gardening and answer questions. Further details will follow, so reserve the dates in your diary. Now would also be a good time to Buy a Brick as the third brick panel will be installed shortly. 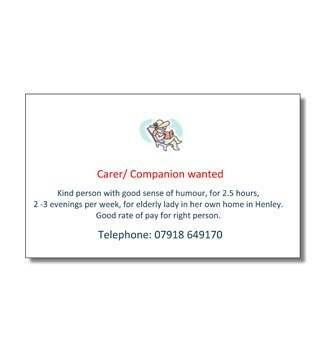 Further details on all of these from Douglas and Sue Bridgewater on 793633.
HENLEY NEWS has an editorial review team which now has more than ten members. They review each edition before it is published and when there are controversial articles, they play a big part in deciding the content. If you would like to join this team please contact the editor. We would like to recruit more women to the team as they are under represented at present as are young people.